In the 1930s, when New Orleans and the country sank into the Great Depression, many of the best musicians had long since packed off. King Oliver left in ’17, Paul Barbarin in ’18, Louis Armstrong in ’22, Danny and Blue Barker in ’30 – the list runs much longer. The jazz diaspora was driven by economic realities yoked to the harsh segregation laws, poverty and poor schooling; yet in so many of the memoirs by musicians of that era, their recollections treat the people and mores of daily life rather sweetly. Life in the city at the bottom of America was, despite the enforced poverty, measurably better for black people than in most other parts of the South, particularly rural areas. Music abounded in streets and dancehalls with parades for the benevolent societies and church groups; the Storyville bordello district in present-day Tremé provided seamier locations as jazz flowered in the early 1900s. When the federal government closed the district in ’17 as a health threat to Navy sailors, much of the sexual traffic moved into the French Quarter. (Mayor Bob Maestri’s furniture store sold mattresses to madams for their joints in the French Quarter, the upper floor of what’s now Arnaud’s restaurant, among them.) But the financial impact came down hard on the musicians. Kid Ory the legendary trombonist fled a threatening mobster who owned a Storvyille joint for warm Los Angeles when Wilshire Boulevard wasn’t too far from pasture. South Rampart Street, starting at Canal Street and running Uptown past Howard Avenue into present-day Central City, burgeoned as a grassroots black entertainment zone in the 1930s, a quilt of honky-tonks, theatres, eateries and small businesses on the main drag and side streets. Not much is left of the architecture today, at least in the CBD; but as an economy of scale, South Rampart Street had a staying power that outlasted Storyville. Florestine Perrault Collins set up shop on South Rampart Street in 1934 as a studio photographer. To make it as an independent photographer in those years was hard, and to make it as a woman in a field dominated by men was doubly difficult. 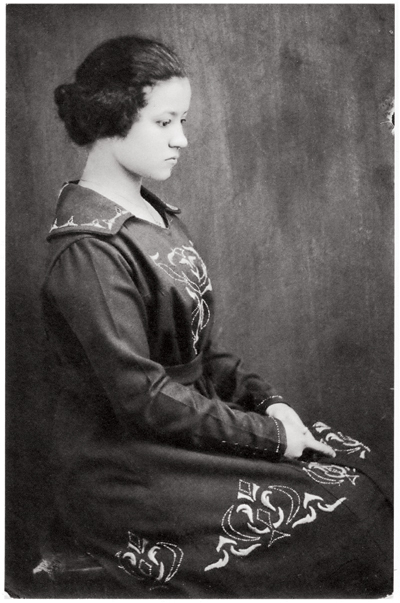 But as the historian Arthé A. Anthony writes in the biographical essay from Picturing Black New Orleans: A Creole Photographer’s View of the Early Twentieth Century (published by University Press of Florida), Collins cultivated her market share. To secure her studio lease, she enlisted a girlfriend whose pale complexion persuaded the owner to give the $40-a-month lease to a white woman. The book cover features a traveling entertainer named Neliska “Baby” Briscoe wearing a white tuxedo half-coat and black tie, holding a bandleader’s thin baton with a gleaming grin. Among the other artifacts, a photograph of Duke Ellington in a group pose, the bandleader grinning with the confidence of a man who got photographed everywhere, while the local Creoles around him gaze at the camera with an intensity telegraphing less self-assurance. Many more of the images in this alluring book capture the genteel tone of downtown Creole life. Case in point: the future U.N. Ambassador Andrew Young, with his brother Walter, in cowboy costumes with black hats for Mardi Gras 1938. Collins’s bread-and-butter work came from the studio portraits, particularly photographs of babies and children. “Ruth Barthelemy, the mother of former New Orleans mayor Sidney Barthelemy, said families made two stops following the birth of a baby – the church and the photographer,” writes Anthony, a professor of American studies at Occidental College in Los Angeles, and grand-niece of her subject. Another photographer, and member of Florestine Collins’s social circle, Arthur P. Bedou, produced important images of the parade culture in a time when brass bands still wore military uniforms and drew upon a repertoire shaped by the marches and military drum rolls that had come out of the Battle of New Orleans, the Civil War and the Spanish-American War, which saw the Onward Brass Band travel to Cuba. Florestine Perrault Collins had the tenacity to establish a studio business, against the odds of gender and race, before photography acquired the aura of an art form. She was a lady more at home with the downtown Carnival and debutante balls of the Creole elite than a Mardi Gras Indian parade or jazz funeral, yet a woman quite at home with music just the same.